" Mosser Track to Home above the Snow Line"
Date & start time: Wednesday 3rd April, 2019. 2 pm start. Places visited : Jon's Seat, Crabtree Beck, the Pine Tree and home. 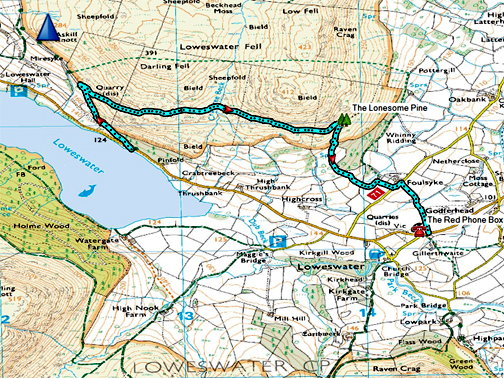 Walk details : 2.3 miles, 620 feet of ascent, 680 of descent, 1 hour 10 mins. Highest point : Slopes of Darling Fell overlooking the world. Walked with : Myself and the dogs, Dylan and Dougal. Weather : Overcast with occasional sun, snow remaining above the 850 ft contour. 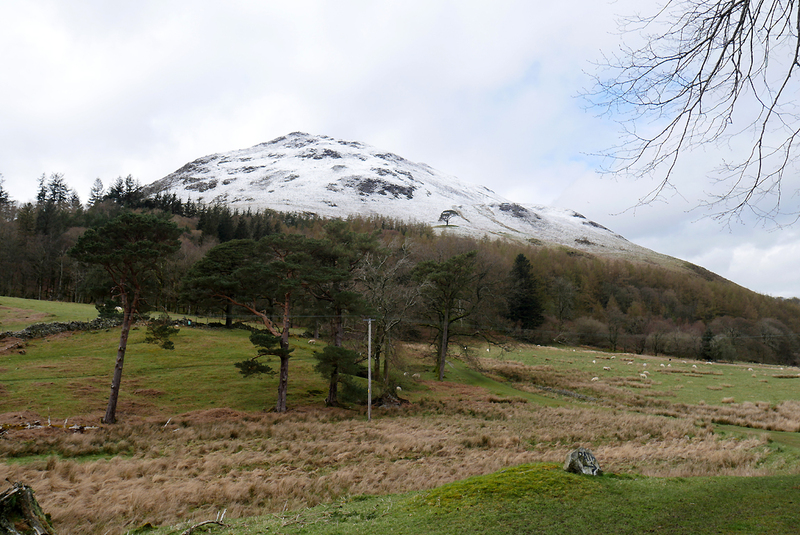 Yesterday we experienced a mild blast of what winter could bring, courtesy of cold winds and wintery showers. 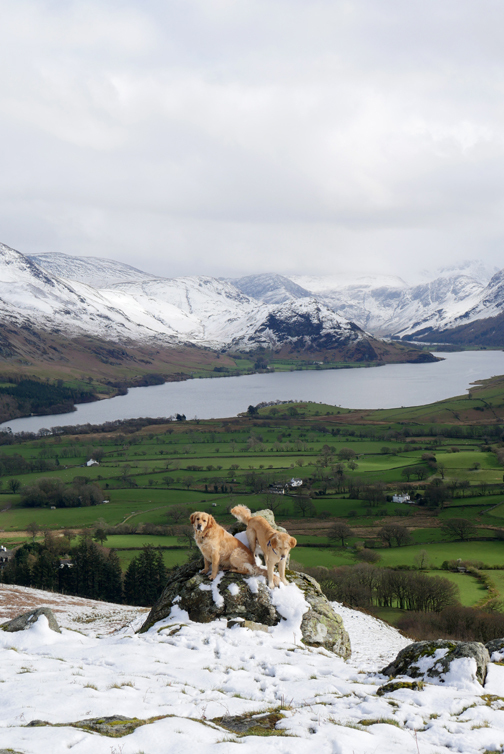 Today we awoke to a full cover of snow, not only on the fells but right down to valley level. The morning was cold and felt rather too unpleasant for a walk, so by the time the nicer weather arrived it was early afternoon. Morning has broken . . . rather grey and soggy. Overnight snow has fallen to valley level but it is melting fast in the just-above-zero temperatures. I decided to delay the walk but would still like to get up in the snow before it melted . . . 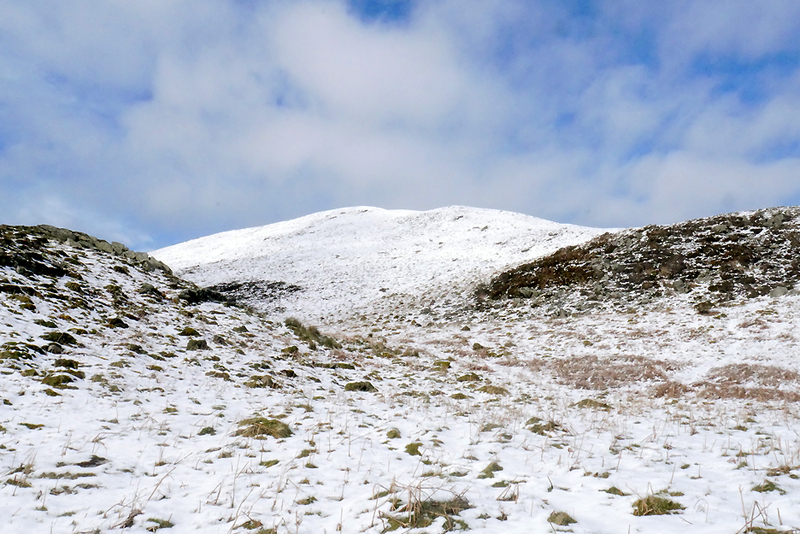 I chose the Darling Fell / Low Fell lower path. 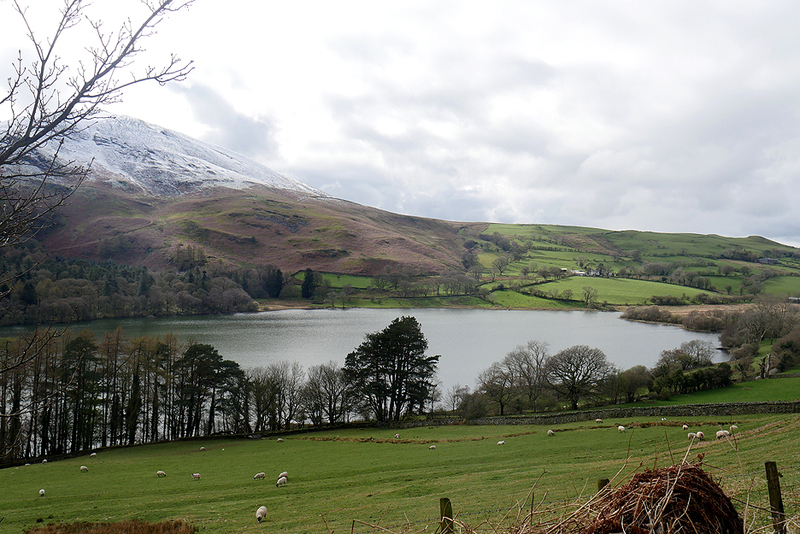 The walk started at the lakeside at the signpost to Mosser saying "unsuitable for motors". 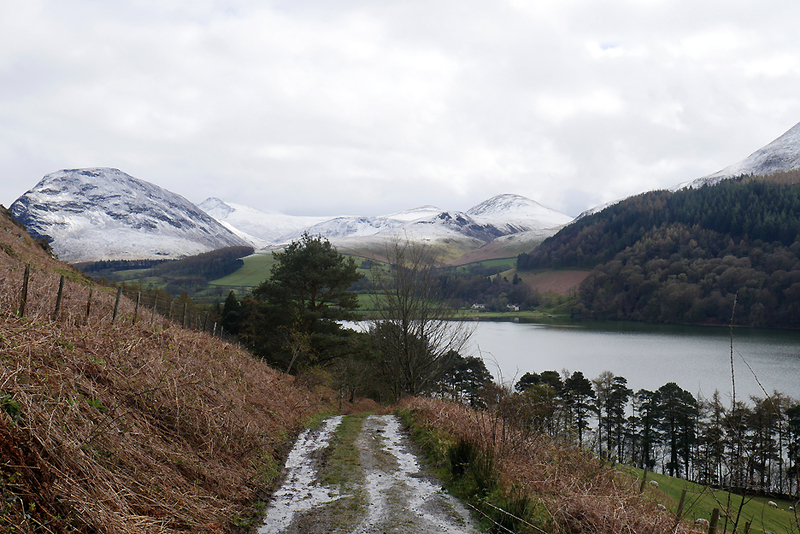 This was the view across the lake to the Loweswater Fells opposite. as time has spread the gravel back into the holes. If you are following your Satnav up here . . . don't ! It seems it has been down-graded to a country lane. Blocked culverts still force water onto the track, which was the start of the problem in the first place. 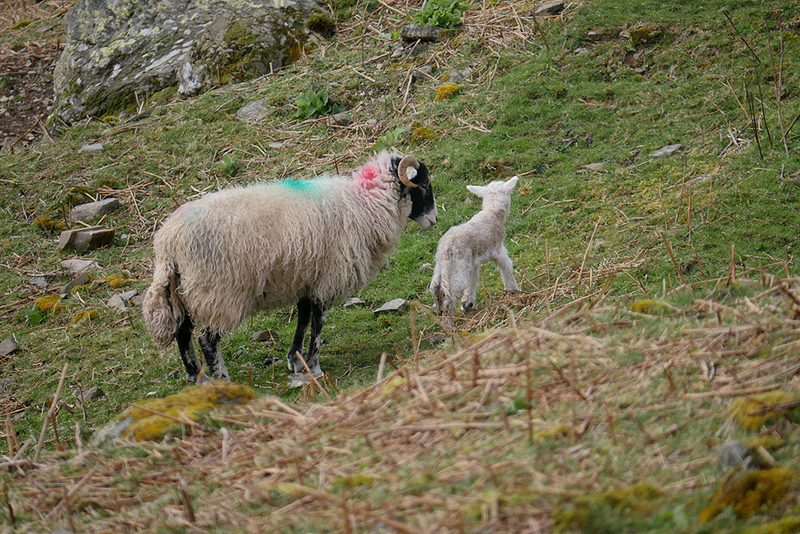 In the Myresyke fields, William's sheep have already lambed, some born into a very cold world this morning. 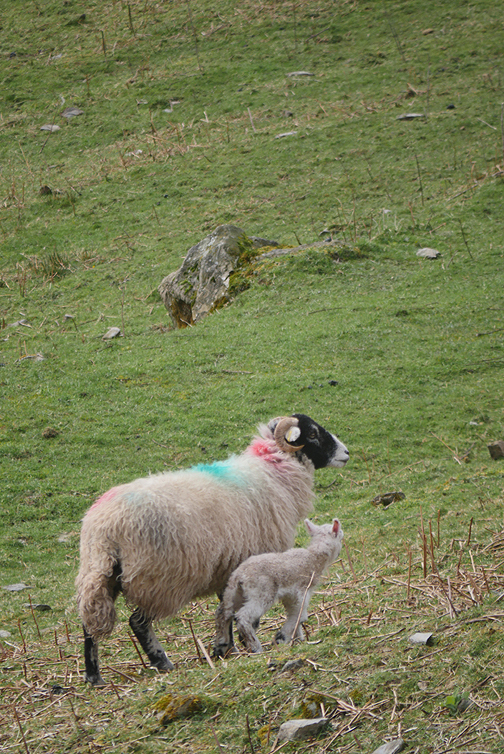 This one still looks a little unsteady . . .
. . . but wanders off with mum's support. 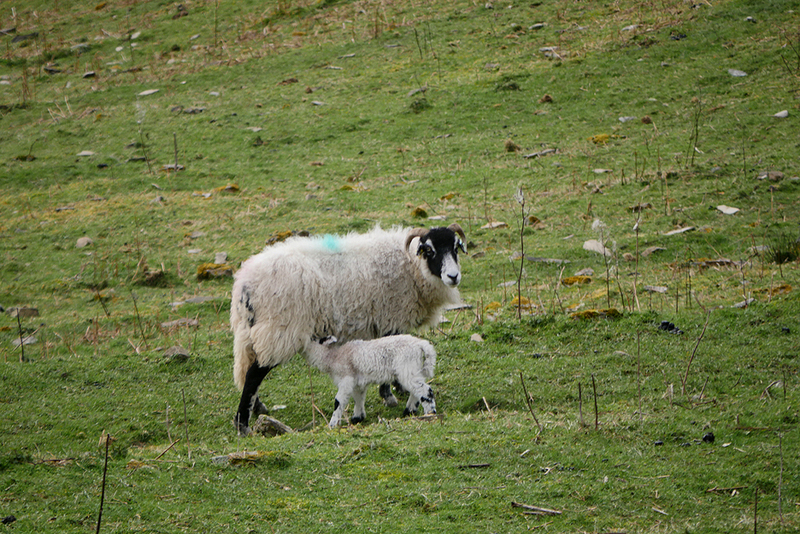 One last photo of the lambs. As I said to a friend later . . . "to show you more would just be encouraging gambolling". 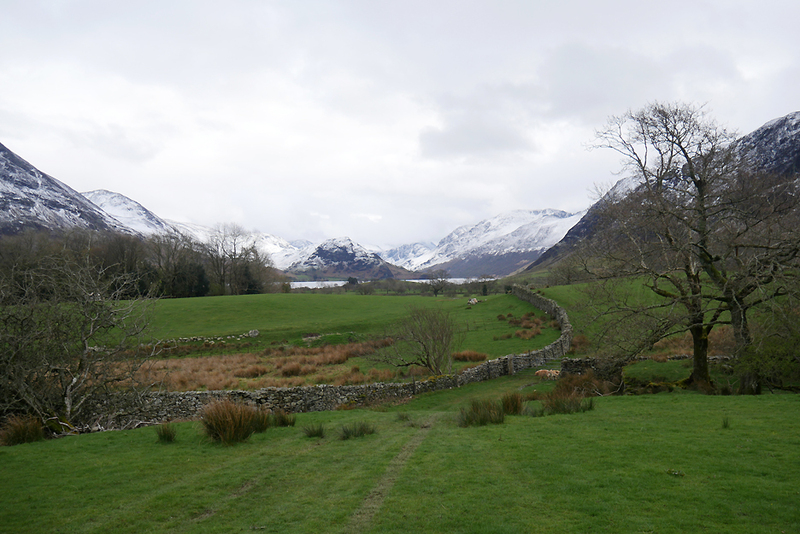 The snow has melted from the valley fields here around Loweswater, as it has around our part of the valley. Up to Jon's Seat . . . and still no snow. 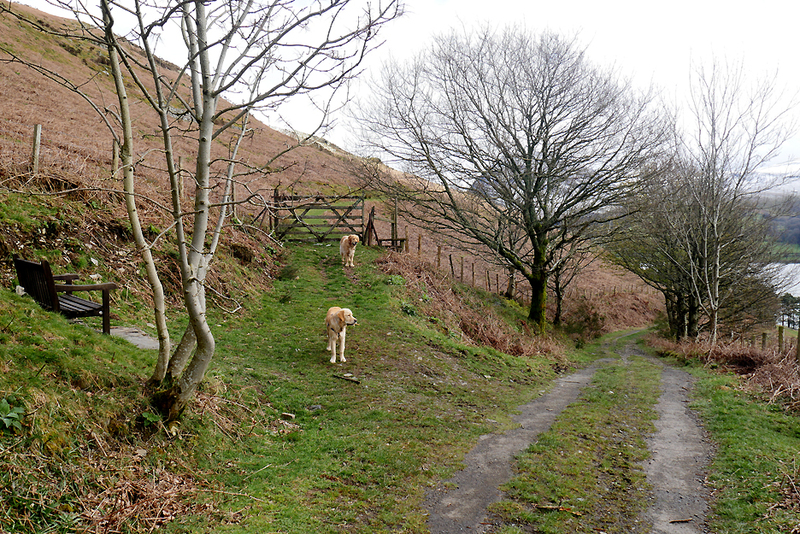 The dogs know which way to walk as they are often up here for a local walk to the old quarry. 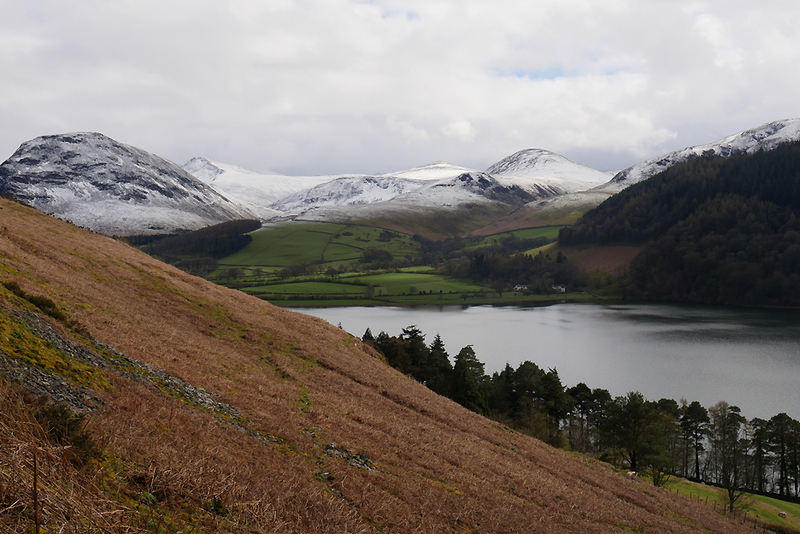 and today the fells opposite are swathed in a winter covering of white. 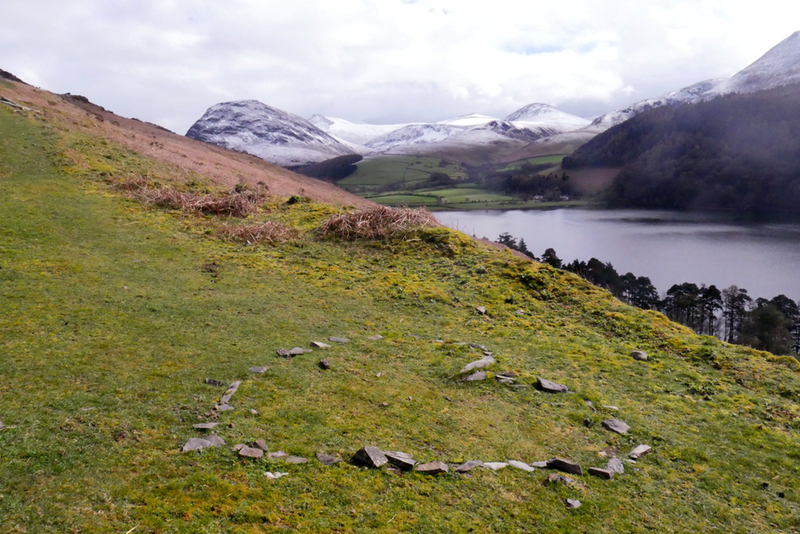 Next to the small stone quarry, on the flanks of Darling Fell, is some appropriate stone artwork in the shape of a heart. Looking up towards the summit . . . now the local colours have changed. 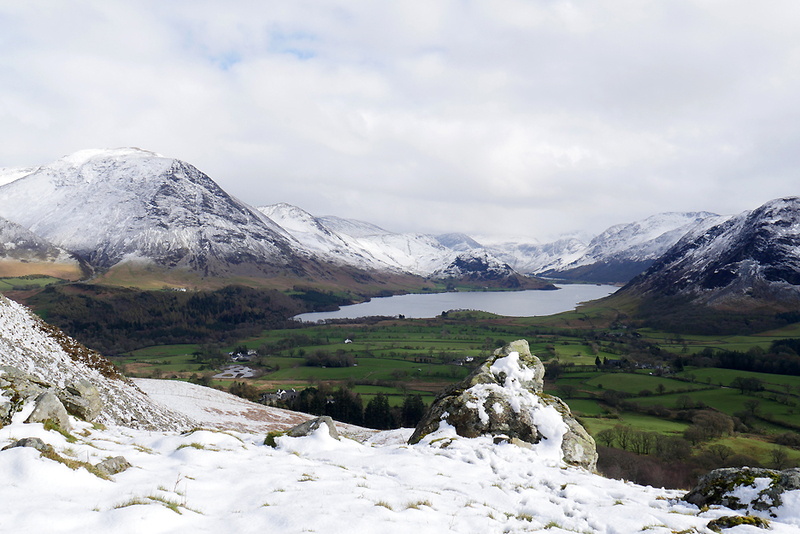 Up onto the bluff that juts out from the fellside and we get our first view of Crummock. 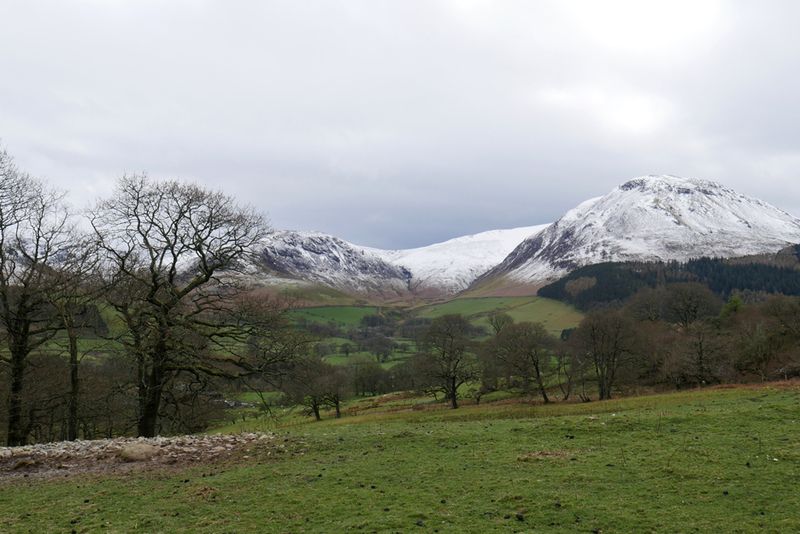 Ahead is the southern top of Low Fell, just beyond the valley of Crabtree Beck. Our path will skirt behind the trees and follow around Low Fell at about this height. Now for a river crossing . . . the undulations and side slopes of this walk are tricky today. The snow is very damp as it is melting fast and the slush on the path is very slippery . . . I often resort to walking in the long grass. 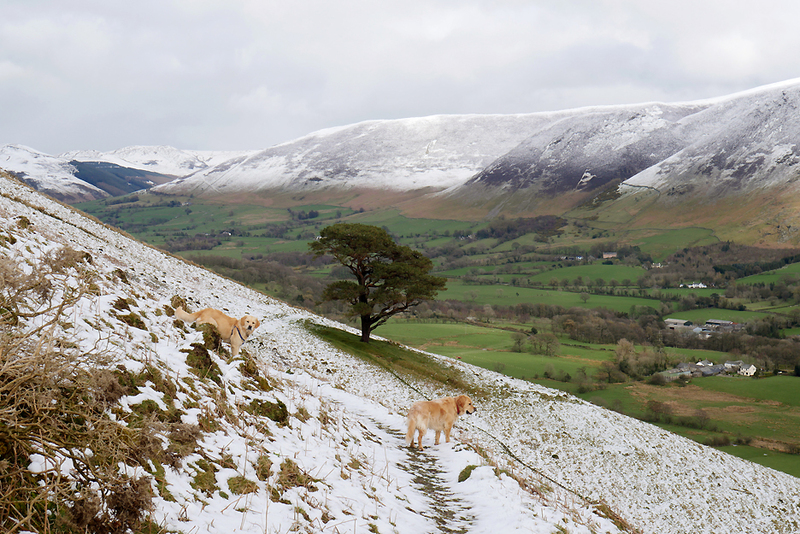 The dogs have no problems with their four wheel drive and built in crampons. 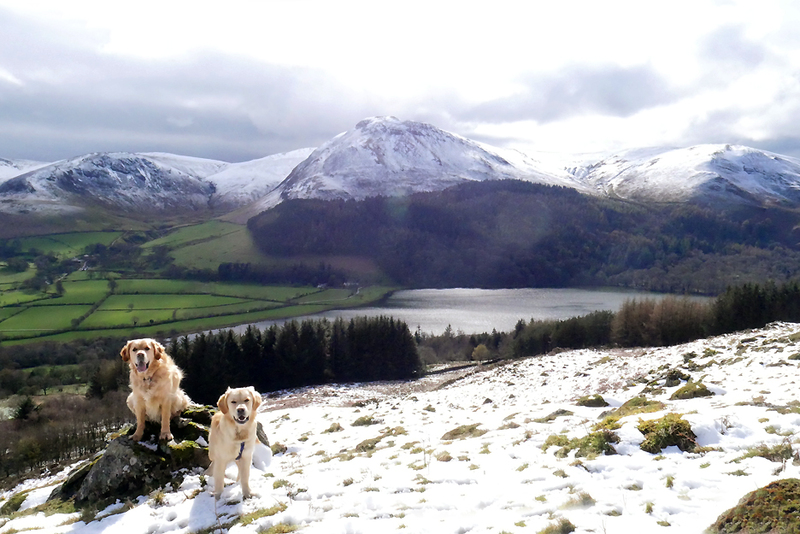 Dylan finds a rock-for-one as I look back at Loweswater, rather too close into the sun for the moisture-covered lens. 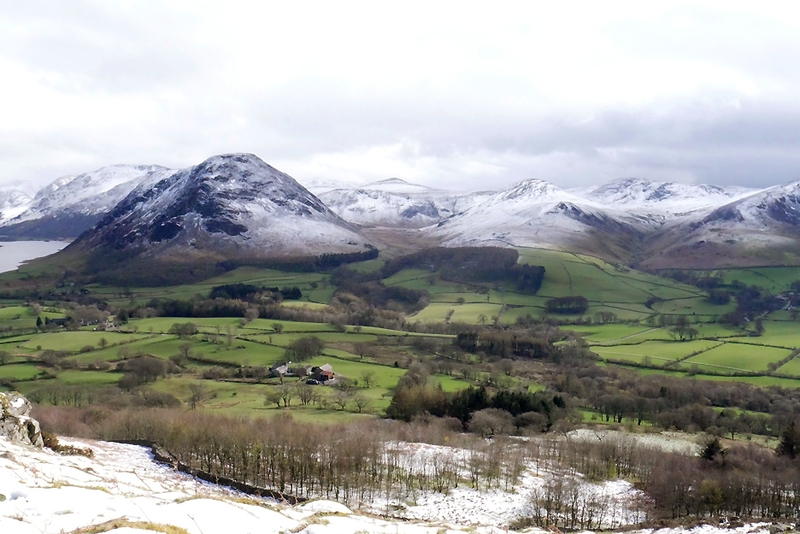 The view down to High Cross Farm and over to the Mosedale and White Oak valleys. 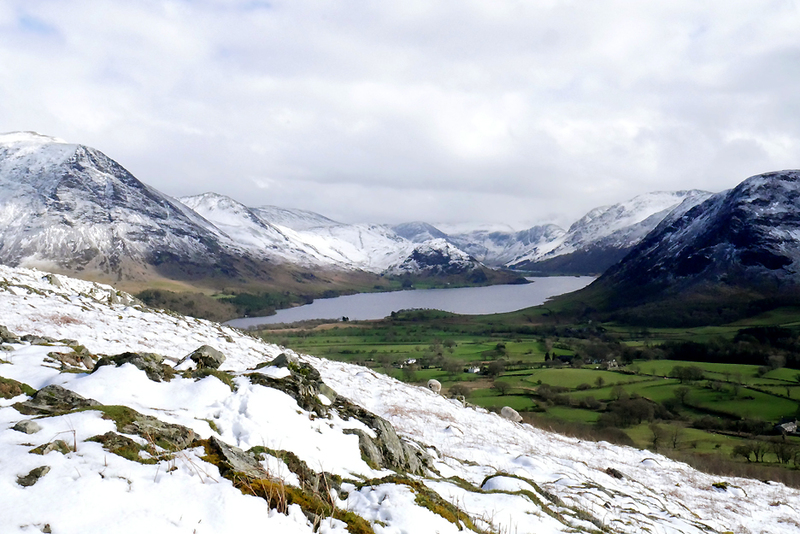 Forward now, looking down on Crummock and the first view of the cottage just to the left of the upper sheep. 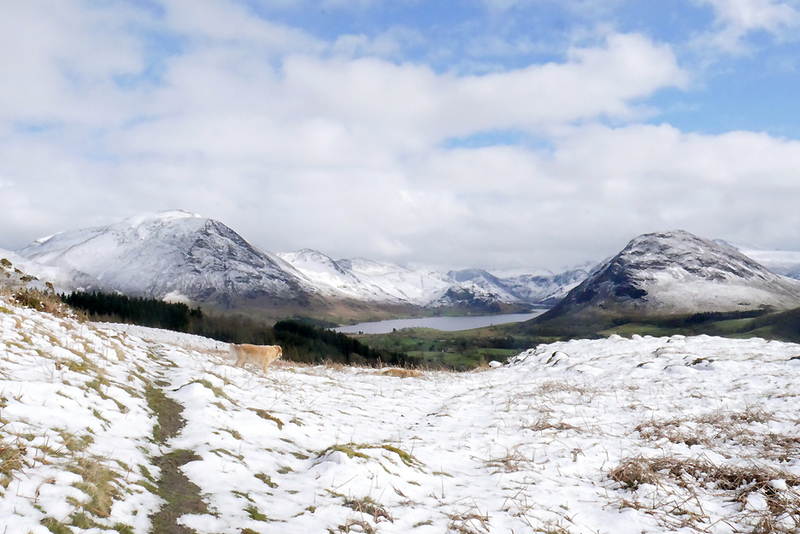 From this angle we can just see Buttermere appearing from behind Rannerdale Knotts. A quick amalgamation of the wider view. before I even had the camera out. even then he's not looking my direction.
. . . but it is too early to think of all that ! They heard the camera shutter click and jumped down from the rock, never to grace the rock again till our next visit. and the old Scale Hill Hotel, now a modern holiday cottage complex, and the pond at Godferhead are in view. 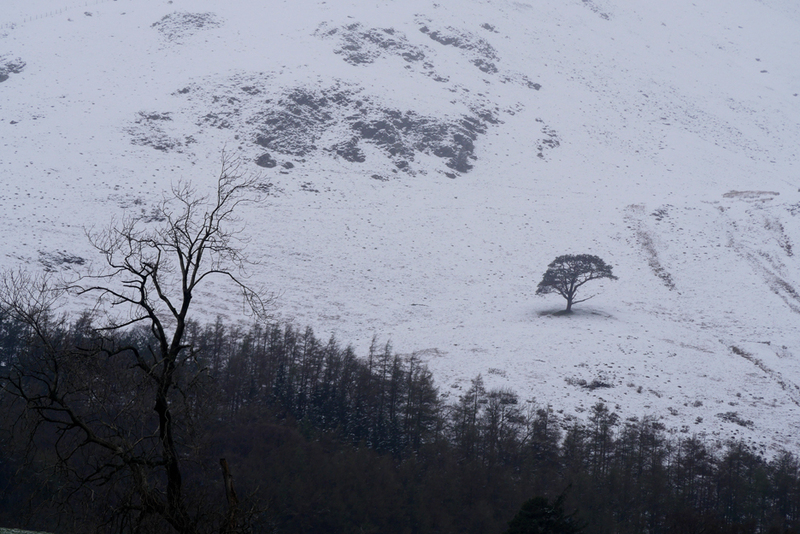 The curve of the fell brings us round to the Lonesome Pine. There's snow to a lower level on this side as this slope faces into a more protected, easterly direction. A small panorama from the other side of the tree. 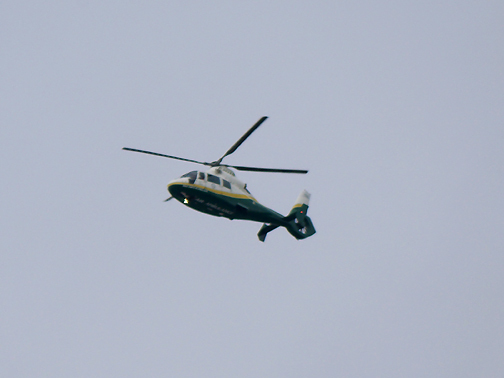 I could hear the sound of a helicopter. 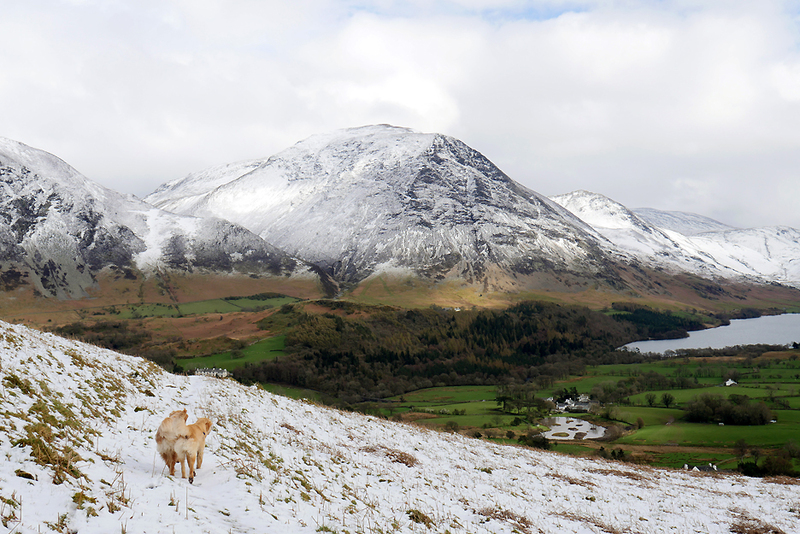 A rapid change of lens and I catch a close up before it heads over the top of Low Fell. I hope that crow is impressed with the flying ability of man . . . even though it makes a lot more noise than he does. Time to head down and below the woods and walking becomes easier as we are now out of the snow. Looking across to the bright, white slopes of Blake . 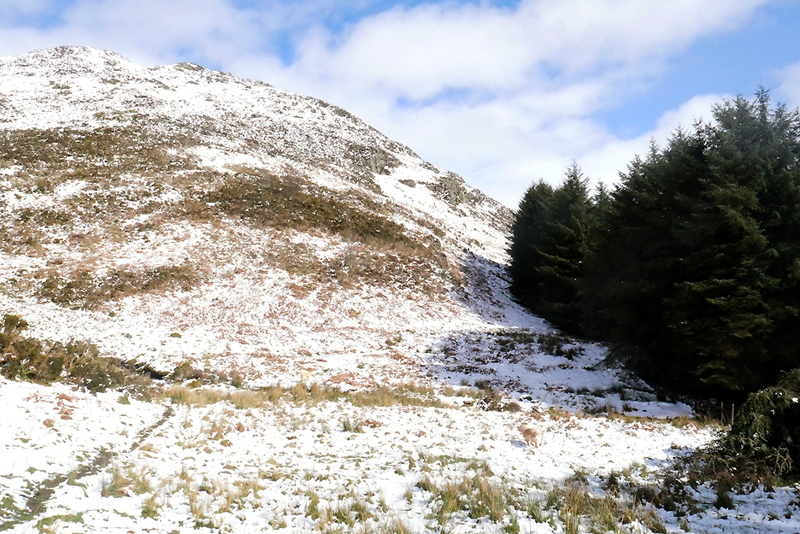 . . will this be the last valley snow of this winter . . . who can tell ? 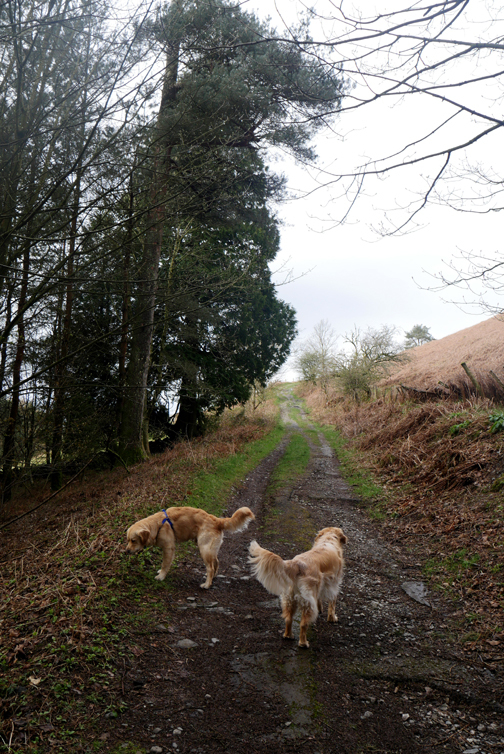 A retrospective of Low Fell with the pine tree just clear of Whinny Ridding Wood. 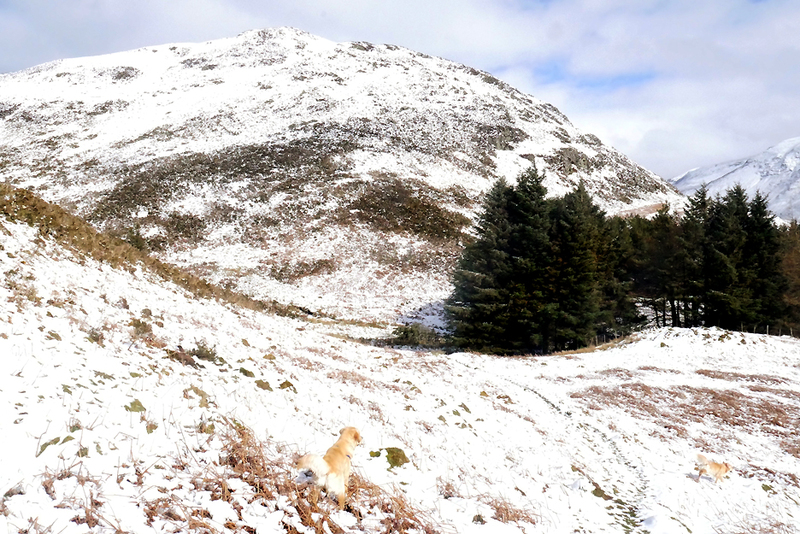 The mixed pine, larch and deciduous woodland below Low Fell is on the market if anyone wants to invest in trees ? 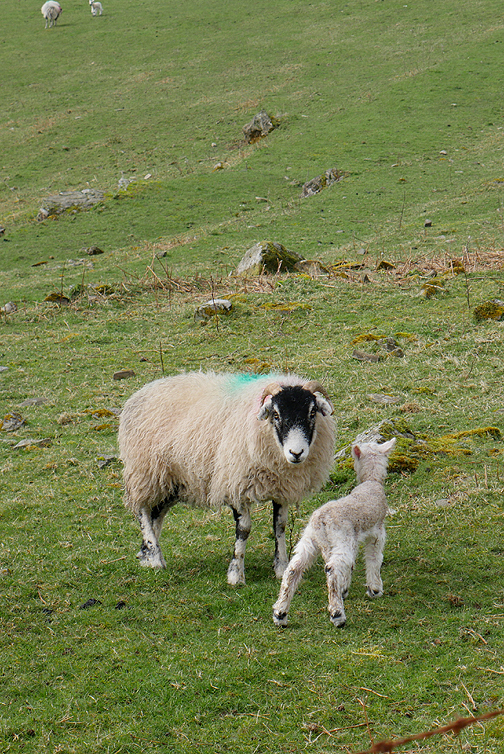 Just one more green field to cross and we're home. The dogs are already waiting for me to open the last but one gate of the day. This site best viewed with . . . a set of small Microspikes on the boots.